Chelsea underlined their title credentials with a superb come-from-behind victory over Manchester City at the start of an engrossing weekend of Premier League action. Arsenal were impressive in victory at West Ham, and Bournemouth stunned Liverpool in a seven-goal thriller. There were also wins for Tottenham, Sunderland, Crystal Palace, Stoke and West Brom, while Manchester United and Everton drew at Goodison Park. 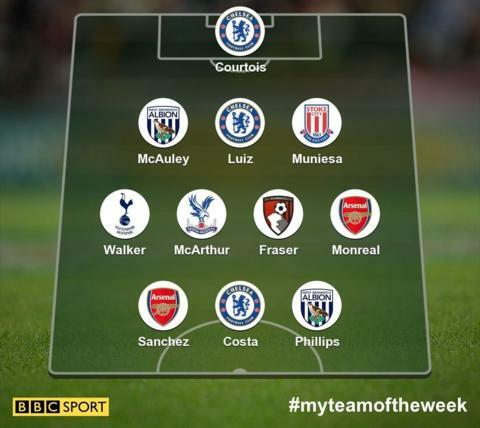 You can see my team of the week above. The tip over the bar from Sergio Aguero during the early exchanges was made to look easy. His next save, and slightly more important, was from Kevin de Bruyne, but his most impressive save was from a second attempt by Aguero, who by now must have been thinking Courtois was unbeatable. It took an excellent finish to beat the Belgium international goalkeeper in the first place but Courtois soon established that he was in no mood to be beaten again. Part of Manchester City's frustration was, having missed a hatful of chances, that Courtois was equal to anything they threw at him. What I adore about Courtois is there are no dramas with him and he always turns up for the big games. Making the save is all that matters to him. He doesn't behave like a star insisting on being beautifully groomed with his attire perfectly positioned. In fact he looks rather ungainly - sporting his preppy hairstyle - but who cares? He's proving to be one hell of a goalkeeper. The tackle by Aguero on Brazil international Luiz reeked of animosity carried over from previous encounters. Neither man was prepared to back down from the battle facing them, but I must say it is not the first time Luiz has come out on top against the Argentine. The rivalry between their two amazing football nations is well known, but the chase for the Premier League title would only have served to add fuel to the fire. I've mentioned before when referring to Luiz that he is in glorious form at the moment, and he niggled, pushed and pulled Aguero throughout the match in the hope the striker would crack - and indeed he did. What Luiz or Chelsea could not possibly have hoped for was that Aguero would react so badly, get sent off and miss games. Talk about Luiz doing his job. He was immense in more ways than one, and left Manchester City having to re-evaluate their title strategy and without Aguero for at least a few games. I saw Muniesa play in a very successful Stoke team against an indifferent Watford. I thought then that this was a player worth watching more closely but his performance against a totally outclassed Burnley was so impressive I thought he was worthy of a mention. His presence on the ball for a defender was clearly visible and indicative of his time at Barcelona as a youngster. His goal, however, was out of the Gerard Pique book. To see a central defender start a move in his own half, follow the ball into the opposition's penalty area and then demand the ball from a goalscorer, get it, and finish like Lionel Messi, was something I just never expected. It was sheer class and reminiscent of Barcelona from start to finish. West Brom in the top six? They were on Saturday night. I must be dreaming. I'm not entirely sure what Tony Pulis has done at The Hawthorns but he's got them playing and believing all at the same time. Their defenders seem to be the real stars of the show at the moment and McAuley in particular is once again proving to be a massive asset. McAuley always chips in with goals, normally from set-pieces, seldom misses games and is totally committed to the cause. The block he made on Troy Deeney to stop the Watford captain from scoring his 100th goal was an intervention of monumental proportions. Pulis is doing a fine job and all he needs to do now is to stop James McClean from behaving like a loose cannon. McClean is a very good footballer and getting involved in scrapes from time to time just for the hell of it will not improve his standing in the game or West Brom's chances of winning matches. The cross for Harry Kane's header during the early exchanges was a statement of intent. What followed was hardly anything Swansea could complain about as they had been warned about the sort of mood Tottenham and Walker, in particular, were in. We've all seen what happens when Spurs fancy it - they can be devastating. However, I would have preferred a draw against Chelsea last week and a comfortable 2-0 victory, as opposed to a swashbuckling win, against Swansea. My reasoning is this: I'm tired of being continuously led into a false sense of being optimistic about the title by a Tottenham team that destroys the lesser outfits yet suffers from stage fright when the bigger clubs come along. Walker is not one of the players who is inclined to fluff his lines on the big stage but what this 5-0 victory over Swansea is likely to do is merely paper over the cracks. Last week's defeat at Chelsea was more than a mere blip - it was a clear indicator that more still needs to be done at White Hart Lane before they can be seriously considered title contenders. It's all well and good putting the Swanseas of this world to the sword - but they are not going to be competing for the Premier League title any time soon. This was an excellent performance from McArthur and boy did Palace need the three points. The Scot looked in commanding mood throughout, and manager Alan Pardew needed it more than anyone. In fact, defeat was not an option. I'm a big fan of Pardew but let's be clear here, regardless of their harrowing run of results recently, Palace are punching above their weight. They've simply lost their way a little. The result against Southampton was impressive and, as long as they have people like McArthur doing the right jobs in the right areas, they should be fine. What they were doing last week, asking Christian Benteke to mark players in the box against Swansea, was something out of a comic book. Defenders defend and attackers attack - why overcomplicate it? I was hoping someone might materialise out of Sunday's fixtures and he did. Fraser burst onto the scene 10 minutes into the second half for Bournemouth when Liverpool were cruising. I have always said Liverpool's defence was suspect and those frailties could not have been better highlighted than against the Cherries. And it was Fraser's hard work and enthusiasm that dragged Bournemouth back into the game. He won the penalty, scored the equaliser and set the fans and ground buzzing with expectancy at what was possible. It would be too easy to pick holes in Liverpool's defence so I am not going to. Suffice to say the quicker manager Jurgen Klopp fixes the obvious problem (and I am not convinced by his goalkeeper, by the way) the better. It was like a scene from Game of Thrones. The hostilities had barely started and West Ham looked under siege in their own keep. Their walls had been breached by Arsenal and these uncompromising Wildings had no intentions of taking any prisoners. What was so alarming was that before the Hammers could draw breath, Monreal had two crosses cleared by scrambling West Ham defenders desperate to clear their lines - and so it continued. Monreal defended with the same intensity as he attacked and snuffed out the dangerous Manuel Lanzini during the early encounters. I have never been totally convinced by Monreal's overall performance for the Gunners, but against West Ham he looked like a man with a point to prove. Take note, Kieran Gibbs. I saw Philips at QPR when they were fighting for survival in the Premier League and I was of the opinion then that he was a player who had all the pieces to the jigsaw. The only problem was they didn't seem to be in all the right places. Now, under Tony Pulis at West Brom, the pieces seem to be falling into place quite nicely. He looks a different player under Pulis' direction and why the 'deep and ever so complicated' Gordon Strachan refuses to select Phillips for international duty is a mystery to me. Scotland must have some very good players if they can afford to leave Phillips out of the team the way he's playing at the moment. You won't see many better hat-tricks than this. Neither will you see a striker just as keen to assist his team-mates as he is to score himself. However, that is Sanchez. What a pro. I found myself howling with laughter watching Match of the Day as Gary Lineker (as I knew he would) took Alan Shearer to task about his definition of a world-class striker. 'Links' absolutely nailed Alan and continued to bait him over the statement that he thought Aguero was the only world-class striker in the Premier League. Well, I'm with 'Links' on this one. Sanchez easily joins that rank and I'm really struggling to understand what he lacks to not fit into the category. I've said it before in this column that when more people agree than disagree about a player's world-class status, more often than not those that agree are right. Costa seems to be getting better and better with every performance. What was most telling about the tackle on Luiz by Aguero and the fracas that followed was that there was no sign of any involvement from Costa. What on earth has Antonio Conte said to him? For some time now I have been saying (unlike most pundits) that Costa doesn't have to get involved. Good players never did. It was the players who couldn't play who were more likely to put it about. Did you see the way Costa span Nicolas Otamendi and left the defender for dead before, and totally unselfishly, he laid on a glorious pass for Willian to score? It was just simply sensational stuff. How ironic that City's golden boy Aguero should find himself adopting the same behaviour we were once castigating Costa for. What's more worrying was that Pep Guardiola was not rushing to condemn the matter either when Match of the Day's Guy Mowbray interviewed the City manager after the game. No-one has sung the praises of Aguero more than me but Pep needs to understand there is a fine line between endorsing the team's commitment and blatant thuggery.